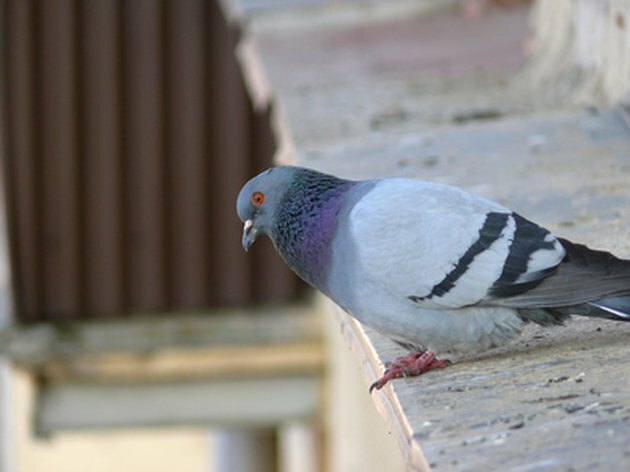 Bird deterrents discourage birds from perching on your property, whether it's your house, deck, or another area you wish to keep clean. You can find a number of deterrents in stores that use different methods to keep birds away. For example, there are noise deterrents, decoy deterrents and bird spikes. Bird spikes are pointy metal pieces that make it difficult or impossible for a bird to perch. You can make your own bird spikes at home using wood and nails. It's not too costly and it's fast. Bird spikes can discourage birds from perching on your property. Use a measuring tape to determine the length of the area where you plan to place your bird spikes. Place a strip of wood onto your work surface that is cut to length. The strip of wood should be a minimum of a half an inch thick and two inches wide. Use your measuring tape and pencil to place marks at 1-inch increments on your wood strip. This is where you install your nails. Use a hammer or a nail gun to insert the nails along the length of your wood strip. Insert one nail straight up, at every 1-inch mark, in the center of the board. Then place one nail on either side of the center nail at a 45-degree angle that points away from the center nail. This will create a V shape with a nail in the center of the V pointing straight up. Paint or stain your wood strip the same color as the surface where you'll be installing it. Allow the paint or stain to dry completely. Place your bird spikes in your desired locations. Use a nail on each end of the wood strip to secure it in place. If the location you intend to place your strips is more than four inches wide, you can make additional strips for that space.